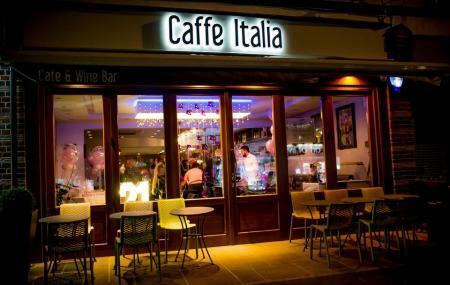 Caffe Italia, as the name suggests, is an authentic Italian restaurant and bar that offers signature Panini, Italiano salads over drink and live music. Music, Comedy Shows, Magic Shows, Radio and talk shows are also organised regularly. Fruit juice, coffee, hot chocolate, smoothies, frappucinos are the best starters of daytime. They have English breakfast as well as vegetarian and non-veg breakfasts too with eggs, ham, sausage, chips and so on. Croissant, Pastry, Muffin, Cake,m Scone, Omlette with mushroom, jham, spinach, roasted veggie fillings, Oven Baked potatoes with tuna, cheese, mayonnaise, chicken, prawn are their special items. You can also try their baguettes, sandwiches, ciabatta, burger, pasta and salads with yummy fillings. Enjoy your food and a great service in this classy bar and restaurant. Love it here! Brilliant cocktail, friendly staff and fantastic atmosphere. Wish we could go more. Just what you'd expect from a busy coffee cafe! Activity, chat, fairly priced for decent fare. Be back soon. This place is a joke for “on the door rules” some trainers are welcome some not! The doorman did not look at my partner as the professional business man! Instead a trouble maker obviously due to his footwear that actually are far from trainers! I wouldn’t bother with this place! It’s full of kids - just like the games of the doormen! Under 18s your love it here! ok for a coffee and cake but do avoid at all costs for food! we had a panini that came with salad (2 strips of lettuce and a slice of cucumber) and soup of the day. which was meant to be vegetable soup but I would call it a broth at best. awful!! Service not great but think the poor girl was new so judgement purely based on food. will not go back. Shame as it's a lovely location and space but a real rip off.